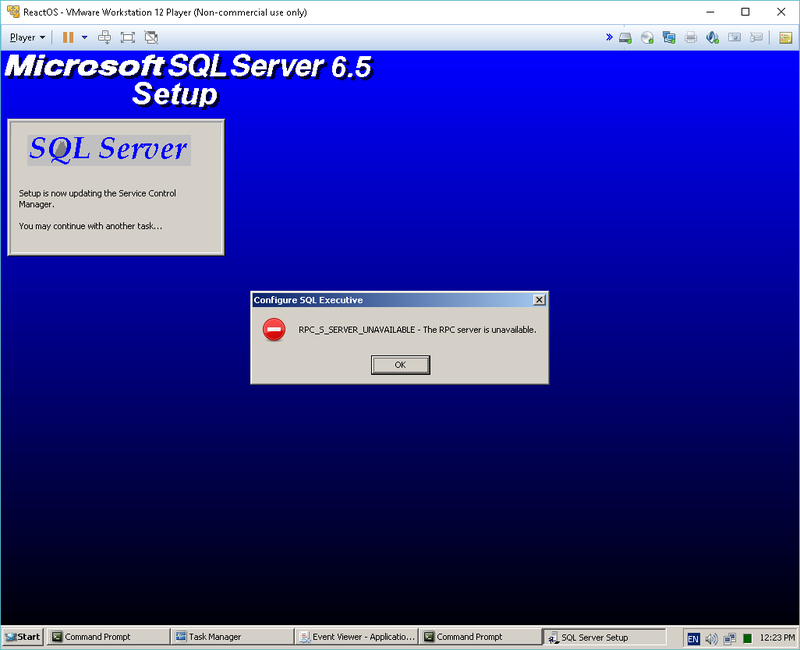 So as a totally unfair test, I thought I’d load SQL server 6.5 on it. After copying in some NT 4.0 dll’s regarding licensing it’ll start to install but the service itself doesn’t work. And the setup program from SQL 4.21 just crashed. Author neozeedPosted on February 18, 2016 Categories ReactOS, SQL Server2 Comments on ReactOS hits 0.4! 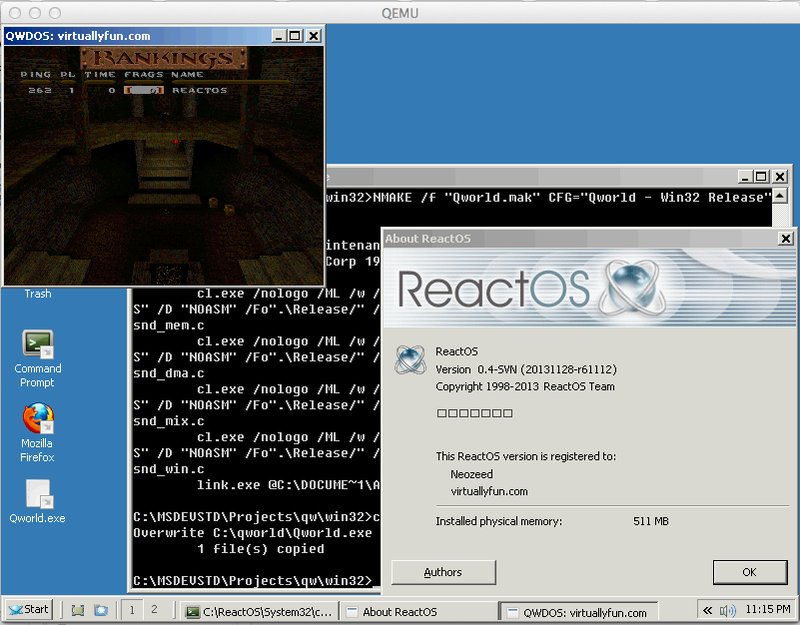 So I thought I’d look for the latest release build of ReactOS, and give it a whirl. First I download 61112, and installed it on Qemu 1.7rc2 on OS X. First I gave the VM a 500MB disk, and 500MB of ram… which led to the thing using the whole disk for paging and was terribly unstable, and all around no good. So next I got smart, used 64MB of ram, and a 1Gig disk, installed then turned off swap. Now it is more usable. I thought I’d do something crazy, and install Visual C++ 4.0. The installer works, except there is no progress, and it can’t create program groups. No problem I think as it does the same thing on CrossOver(wine). 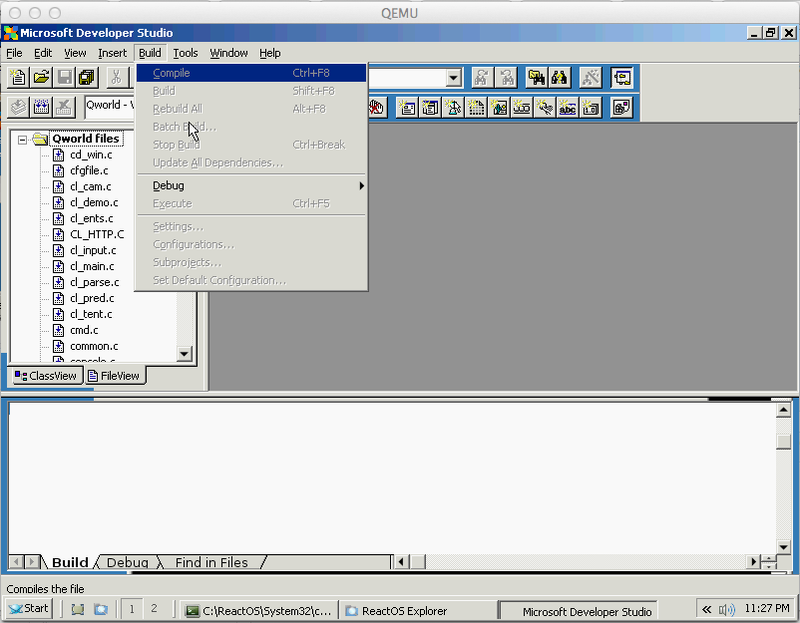 I download my QWDOS project with firefox, extract, and open the makefile and… all the menus are blanked out. And dropping down to the CLI, although the installer ‘registered environment variables’ the compiler wasn’t in the path.  Clearly registry information is dropping. So falling back to nmake I can at least compile my release build, and amazingly -it works! So is it perfect? No far from it, but it certainly is a lot more usable than it was a year ago. Really I saw it right here! It is only in it’s beginning stages, but it can run some very simple COM programs. I should also say, I ran a nightly build, and it is coming along much more than the last year.. I didn’t trap or anything messing around. What I did do was run out of disk space with a large swap file, and downloading too much crap….